No suspense here, I'm just going to cut to the chase. As you can see from my Garmin in the above photo, I finally broke that sub-5 barrier! I earned a whopping 33 minute PR and can now proudly say that I have the number 4 as the first digit in my marathon finish time! I have worked hard for this and I am ecstatic that this day has finally come. I thought it never would. This was an emotionally charged race for me. 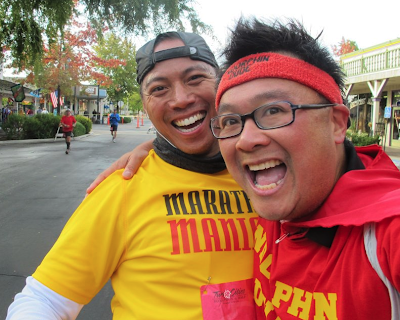 It was at this race last year that my good friend Pete ran his first marathon as a newly minted Marathon Maniac. Unless you've been living under a rock the past few weeks, you probably heard that Pete suffered a brain aneurysm and a stroke and died in September. 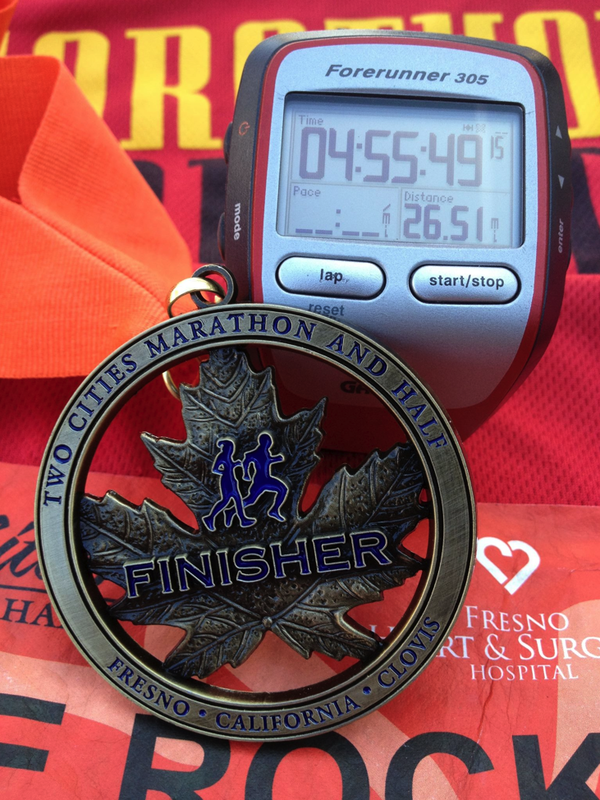 The Two Cities Marathon was an important race for Pete. I remember seeing him on the course last year, proudly sporting his yellow and red Marathon Maniac tech shirt. He was so happy to be out there representing the Marathon Maniacs for the first time. We had been Facebook acquaintances, but it was after this marathon that we became friends. At the end of 2011, Pete sent me a message asking if I wanted to grab a bite after work, his treat. I had a hunch as to what his intentions were, so the first thing I asked him when I arrived was, "does your wife know?" He looked at me blankly, and I followed with, "does she know you are pursuing Titanium?" Pete smiled and asked how I figured it out. I told him that I knew. I just knew. I gave him my input and we put together his schedule. Pete called me his "Titanium Yoda." Pete followed through with his quest. Week after week, he cranked out marathons and 50ks. Along with Jonesy, who was also pursuing ten stars, the three of us became Titanium Beast Brothers. 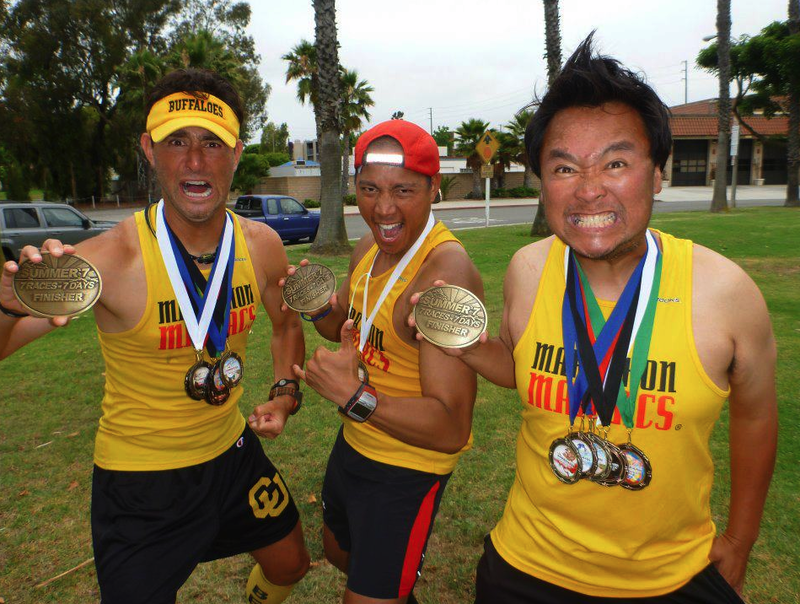 We were the three musketeers of Marathon Maniacs. I cheered these two on every weekend and relived my Titanium quest through their races. Every Monday morning I received text and Facebook messages from them updating me on their progress. The three of us had a solid bond. On September 17th, Jonesy called to inform me that Pete was in a coma. Jonesy and I joke around a lot, but I knew right away from his tone that this was serious. Pete's brother had contacted Jonesy because he saw our photos all over Pete's Facebook wall. I was in absolute shock. I had just seen Pete a few days earlier at Diablo. I felt sick to my stomach. Jonesy gave me all the details and let me know that Pete's family wanted us to see him one final time. His family knew that running was very important to him, and they wanted his running family to be there. Seeing him in that hospital bed made me very sad. Later that week, the plug was pulled. Pete died on the following Saturday. I got to see my buddy for the last time at the memorial viewing before the funeral. It was awesome seeing him in his running gear with all his medals in the casket! His brother said that this is how he always wanted to go, and I loved that his family honored that wish. I was given the opportunity to approach the podium and say a few words to his family and non-running family and friends. I told the story of how at my mile 78 or so at my 100 miler, Pete came storming out in a bathrobe, singing tacky disco tunes. He, too, was at about mile 78 or so. I just couldn't believe that he still had that energy in him after nearly 24 hours of running! His positive energy was like a shot of GU to me, and I quickly was able to get going again. Everyone in the chapel smiled. That's the thing about Pete. He never allowed anyone to get down on themselves. I closed my speech by saying that I was going to walk away smiling and giggling because that's exactly what he would want me to do. I ran hard today. Every kilometer of this 26.2 miler, I thought of Pete. This was our race. At the Summer Seven, Pete pushed me hard. Today, he pushed me even harder. When I crossed that finish line, I nearly lost it. Yes, a tear or two streamed down my cheek. I earned a huge PR, and in my heart and on my bib, those two letters stood for "Pete Rocks." Rest in peace, buddy. And on a final note, I am very proud to say that both my Titanium Beast Brothers earned their ten Marathon Maniac stars. The powers that be awarded Pete his honorary Titanium, and shortly after, Jonesy got his. I am one very happy Titanium Yoda! Sniff Sniff - where are my tissues? What an amazing tribute. OK, this was WAY moving. Very nicely done Tony. Aw, now I'm crying again. Sweet tribute. Thanks, Tony. I wish I knew Pete, he sounds awesome.